In my last post, I showed the video game scores I was able to add to the collection. For this post, we will see my share of the toys we were able to win. Literally, we will start off small. 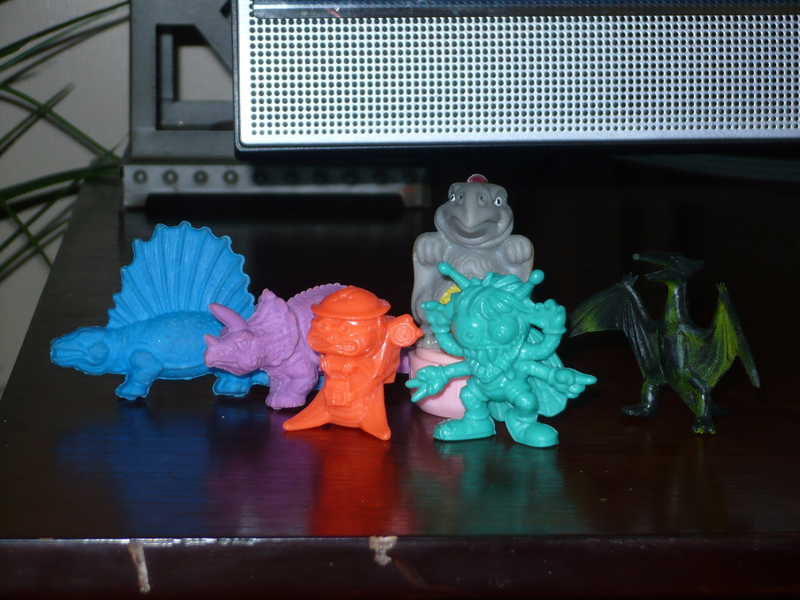 Here we see a couple of dinosaur erasers, a pterodactyl stamper and a generic pterodactyl. But the real stars of this group are the 2 TMNT mini “sidekicks”. Pictured above is Fish Stix(who came with Ray Fillet), and Mutant Fly Friend(who came with Napolean Bonafrog). These Sidekicks are basically accessories for certain figures, and as such were commonly lost. But they appeal to me, and I am now sort of collecting them. Three of these are McDonald’s Changeables. 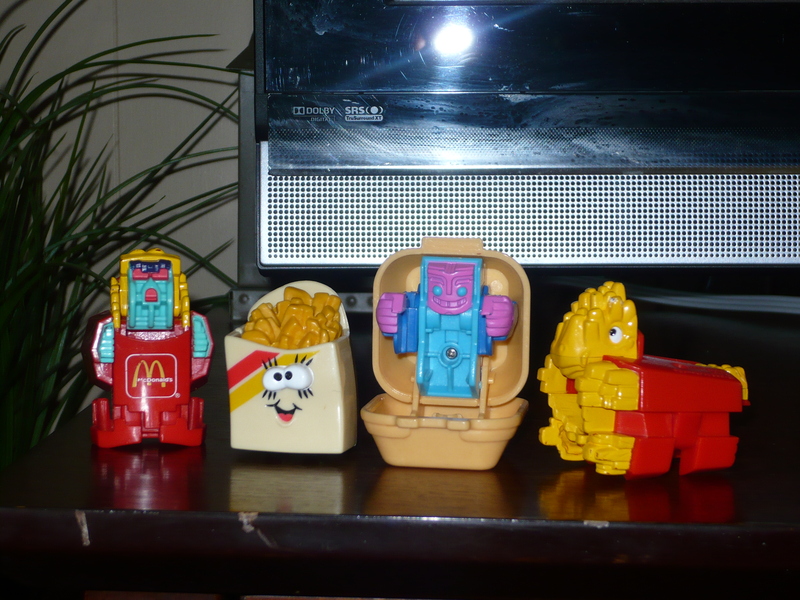 The French fries on the left, and the Quarter Pounder are from the first Changeables series(the first series were robots), while the fries on the right are from the second series(the second series were dinosaurs). I’ll never pass up ones that I don’t have, and they’ll typically run you 25-50 cents(I’m partial to the robot variety), but expect to pay way more if you decide to look for them on Ebay. The second toy(the ones that I haven’t already mentioned), is another carton of French fries, but I have no idea what it is from. It’s stamped 1989 Hallmark Cards, and I have no idea what, or where it’s from. I would guess that it’s another fast food toy, but I can’t be sure. Any help identifying it is appreciated. And now we’ll move onto some larger, more familiar action figures. Any Ghostbusters I usually find are broken, or extremely played with. These 2 are from 2 different lines, but I didn’t have an Egon or Peter until now(and they’re the 2 best ones). 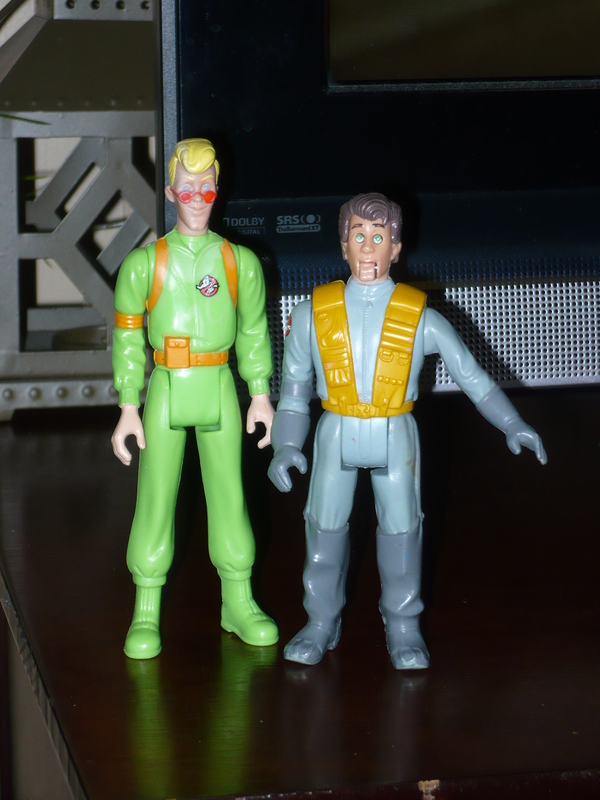 Egon is from the Slimed Heroes line, and Peter is from the Fright Features line. The Fright Features figures were pretty cool(I also have Winston from this line). You would activate the features by pushing down(the obvious), outstretched arm. The feature makes their faced go all crazy-cartoony scared. It’s actually a pretty cool gimmick. Here is 3 different lines of awesome! First up is Witterquick from Visionaries. I already had him, but my previous figure was missing his helmet, as well as a thumb. Upon closer inspection, you will also notice that his chest hologram is not correct. His hologram is supposed to be that of a cheetah, not an eagle(?). The funny thing is that the figure that was previously in my collection also had the incorrect chest hologram(don’t remember what it was, it’s already been passed on). These figures aren’t exactly common, making it a nice find. The we have a DC Comics Super Heroes Robin. It’s basically the same figure as the Robin from the Super Powers line, with a few differences, of which I don’t know the exact specifics. I would love to get a Batman to accompany him, as he is displayed next to my only Batman figure(it’s from the Nolan trilogy, but I don’t know the exact figure, it was a gift). The figures from this line I have a few memories of, specifically the black suit Batman with the grappling hook belt(currently looking for one). Robin’s kick feature works well, and his cape is intact! Then there’s Steelwill from Silverhawks! 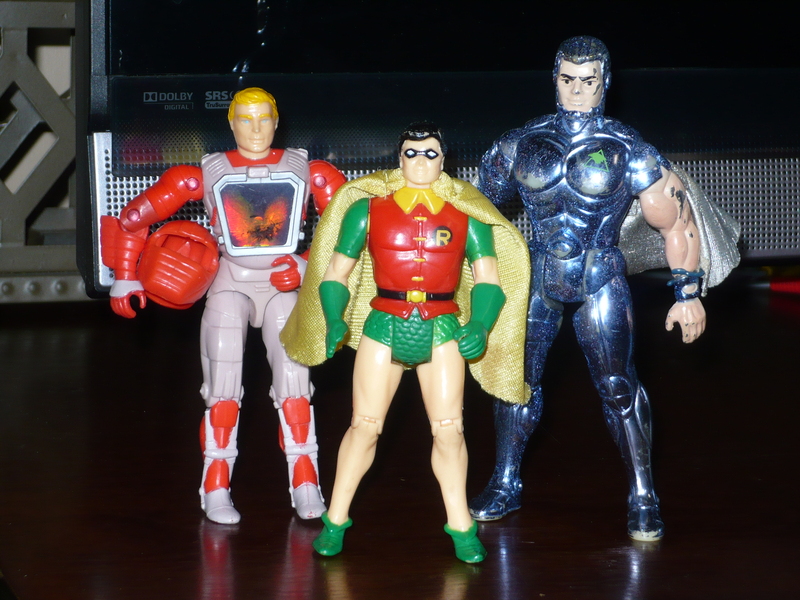 I haven’t crossed paths with a Silverhawks figure since I got Quicksilver back in 1986. When I found this guy, he was missing an arm, but it was included, and an easy fix. The action feature works well, and although worn, it still displays pretty nice. I never thought that I would ever be able to find and purchase Rock Lords somewhere other than Ebay. On the right is Boulder, and on the left is Magmar(I know that there is also a Pokémon with this same name). What’s pretty neat that these two just happen to be the leaders of the respective good and evil Rock Lords. I was pretty amped to find ’em! Lock Lips is the star of this group(and maybe of all the figures found). Madballs are hard enough to come by, so Never in a million years did I ever think that I would come across any of the head-pooping action figures. It’s feature works very well, and the figure itself is in pretty nice condition. The Masters of the Universe knock-off only has MACAU printed on the side of one of the legs. I have nothing else on it. 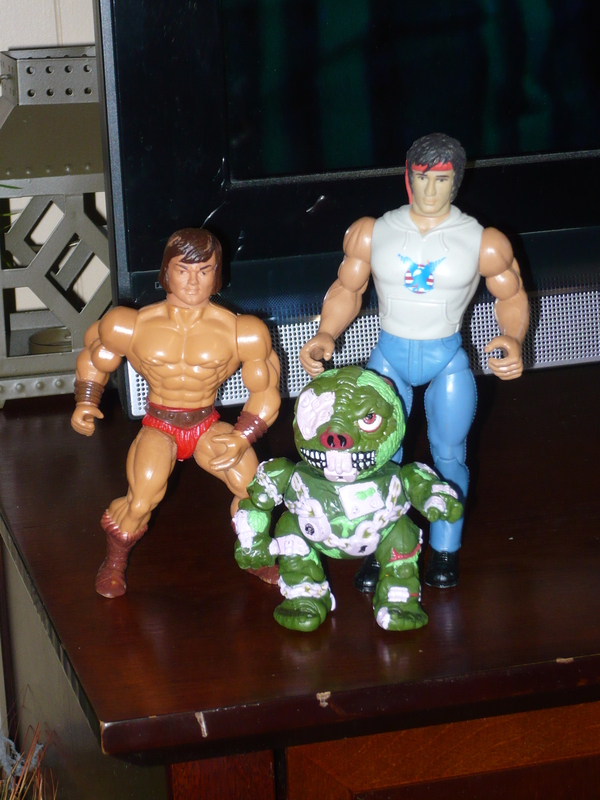 And rounding out the trio is a Rambo figure. I had a few of these when I was a kid, and while nice, I’m actually indifferent with this one. At least he’s wearing his trademark bandana. The following all came ion the lot with the TMNT Sewer Playset(as well as other figures and accessories), and we got it all for $25!! Insane! 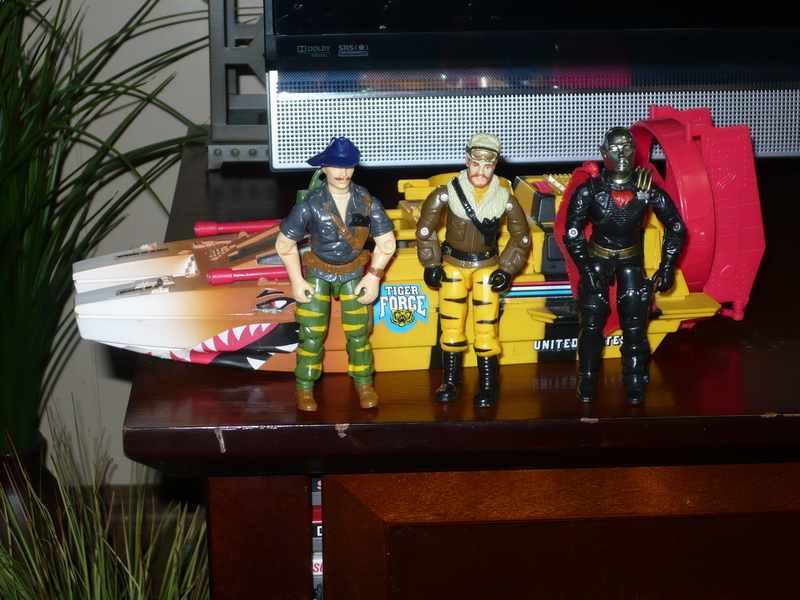 I thought that it was pretty awesome to fins the Tiger Force “Tiger Shark”. 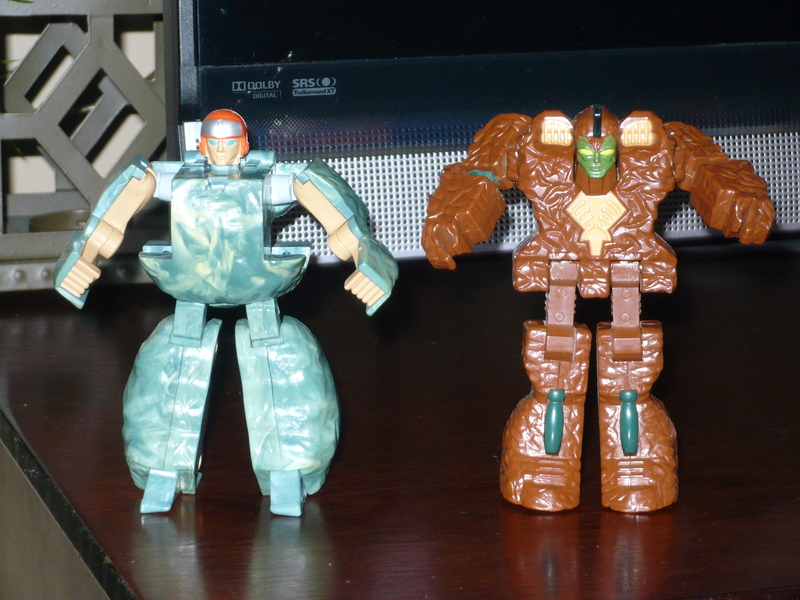 We have Tiger Force Recondo, and Tiger Force Frostbite. Destro is the second version of the figure, and is a fine addition to the Joe collection. The Tiger Sharks stickers all seem to be there and are in great shape. I wouldn’t mind adding a couple more of the vehicles from this line in the future. 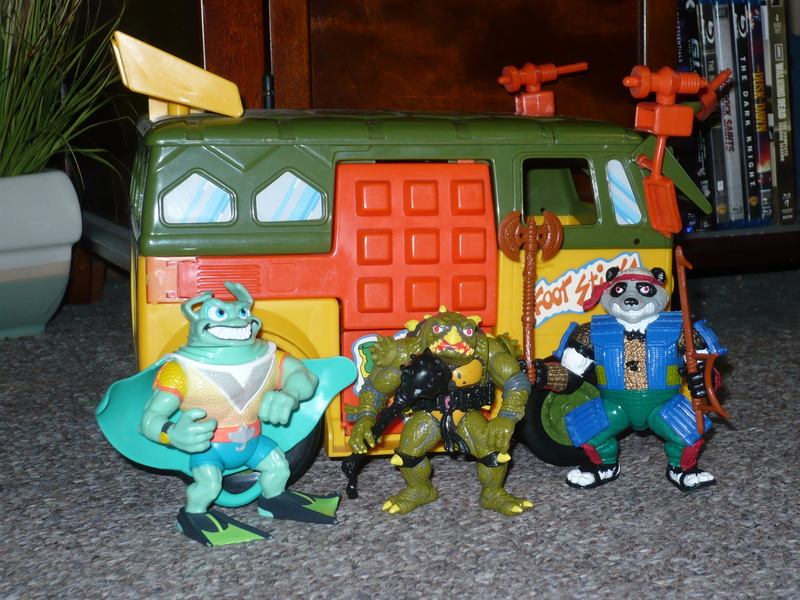 And obviously, there were TMNT figures to be had. There were a pretty decent number of figures, and I needed these. Ray Fillet’s accessories(including Fish Stix), are accounted for. Tokka’s fingers are chewed on the left hand, but now Rahzar has his partner. He’s basically Slash, and I’d compare, but mySlash fell ofo of his shelf, and his head broke off(can’t be fixed). Panda Khan had a few accessories in the mix. There were a lot of accessories in the lots, and a good amount of them actually went to the figures in the lot. There were also weapons and accessories for figures that weren’t in the lot. Almost everything that goes with Mutagen Man was present, except Mutagen Man himself. But considering the amazing luck we had at this auction, I have zero room to complain about a figure not being there. But I now have the small, easily-lost parts for the Mutagen Man I will eventually add. The Party Wagon is in pretty good shape, with a few flaws. The side mirrors have been chewed and mangled, as has the radar on the, windshield shield? You know what I mean. It’s missing on of the Foot Bombs, and that’s about all that’s wrong with it. Maybe I can do a comparison post of this and the 25th Anniversary Party Wagon. And that’s what stayed with me! I sure hope future auctions yield similar lots. If you have any questions, please feel free to ask.